Quiches are becoming one of my favorite foods – combining the rigor of baking with the craft of cooking satisfies both the scientist and artist within! Quiche is the kitchen sink dinner (everything but the…). Assuming you have enough eggs and milk, you can use whatever random ingredients or leftovers that are taking up space in the fridge. First let’s talk crust. This one is 50% whole grain, and I used a soft white spring wheat that we milled at the bakery. This type of wheat would typically be labeled “whole wheat pastry flour” in the grocery store. It is a whole grain, but it is a variety of wheat that has lower protein content than the kind you would use for bread. 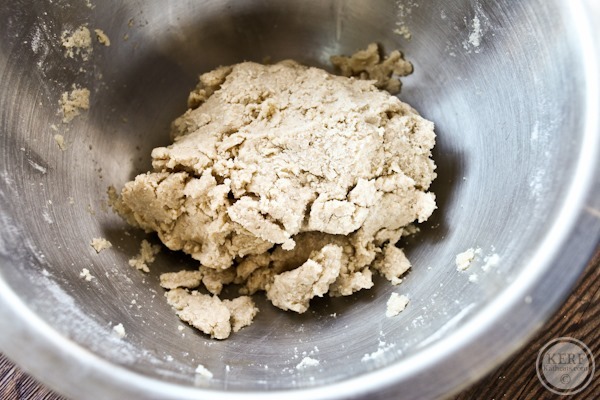 This means it won’t have too much springy chew like a bread, and it also won’t absorb as much water as bread flour. It also has a subtle, nutty flavor that I think is nice for a background taste of whole wheat. 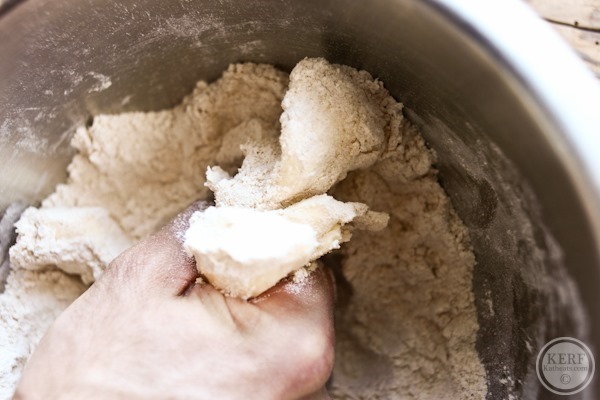 Begin by adding the flours and sugar to a mixing bowl and stirring to incorporate. Note that this recipe is written for salted butter, but if you’re using unsalted then you should also add 3/4 tsp granulated salt and stir to incorporate. Then add the butter. So I just want you to know that I cheated. 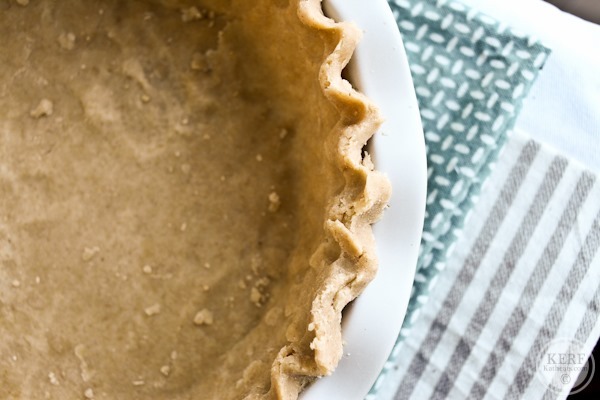 Every single pie crust recipe you see out there will encourage you to use cold butter to make your crust with a food processor or mixer. 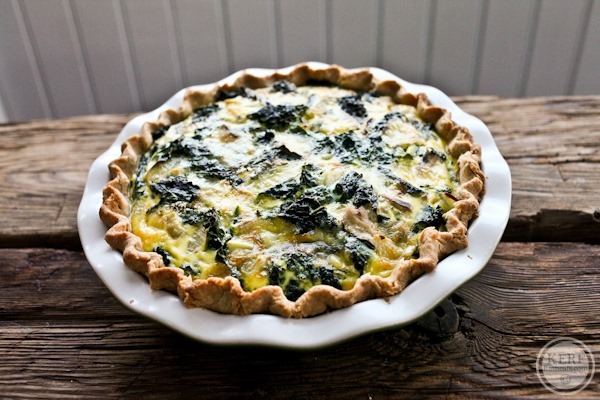 But quiche is not like pie – with pie, people will frequently comment on the quality of the crust. Not so with quiche – the fillings are the star. 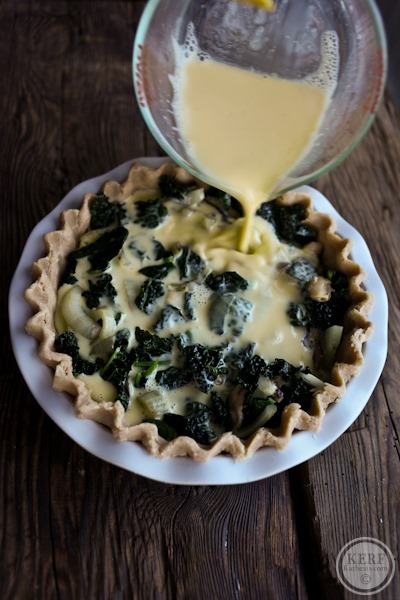 I use room temp butter with quiche crust because it takes less time to incorporate. Okay, so I’m lazy – nobody will notice. Squeeze the butter into the dry ingredients. By the way, feel free to use a food processor to make the crust. Just use the plastic blade (see, it IS used for something). 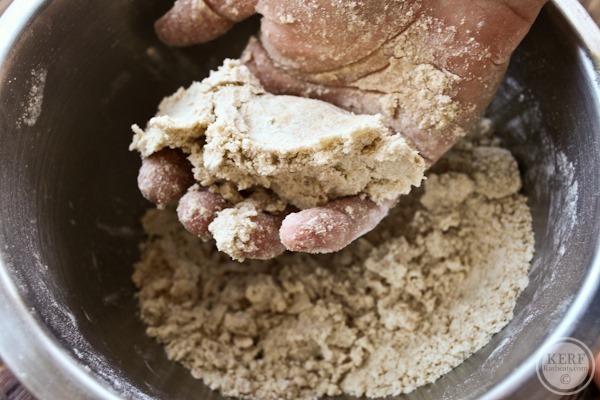 Lightly flour your working surface, turn the dough out onto it, and sprinkle some more flour on top. Begin to evenly roll it out. Don’t worry about splitting. 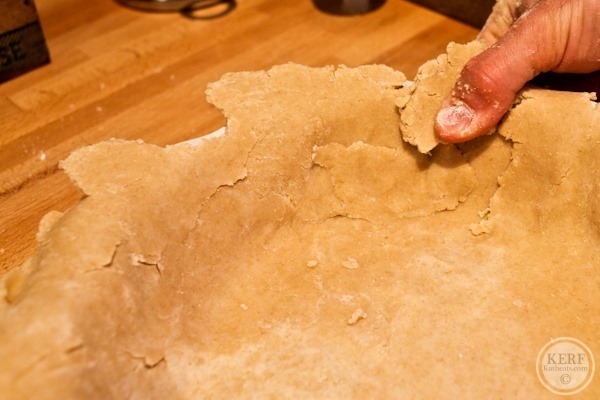 If it breaks, just mend the seams by re-squishing the dough together (yeah that’s a technical term). Roll it out to be slightly bigger than the target pie pan. You can prepare the crust to this point a day or two in advance and then just refrigerate it. Or you can mix it into a dough ball and freeze for quite a while. Now onto the filling. Again, you can use just about any ingredient you want to reach the requisite 3 cups but whatever you use, it should be fully cooked. 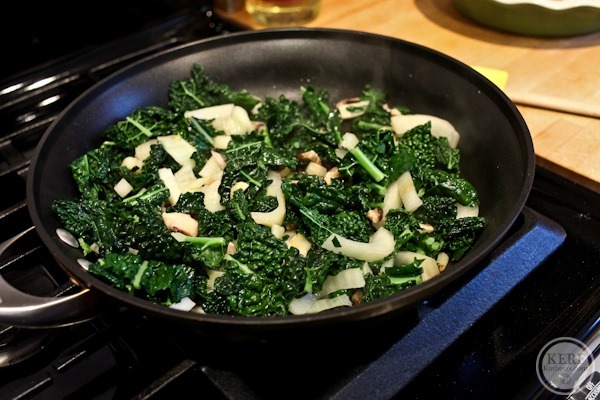 We sautéed shiitake mushrooms and fennel and then finished with some chopped lacinato kale. The fillings should be lightly salted. 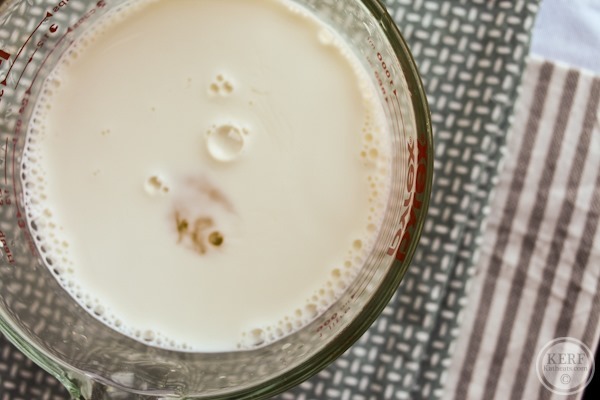 While the fillings are cooking, prepare the eggmilk. Add cheese on top, if using. Cheese is notoriously difficult to taste in quiche so use something flavorful like bleu or a REALLY sharp cheddar. It can be grated or cubes. Goat cheese is always nice! Bake for 40-60 minutes. First check of doneness is if the liquid doesn’t wobble when the pan is jiggled. Second check is if it springs back when you lightly press down with a finger. Also note the browning of the crust and the top of the quiche. Yum! 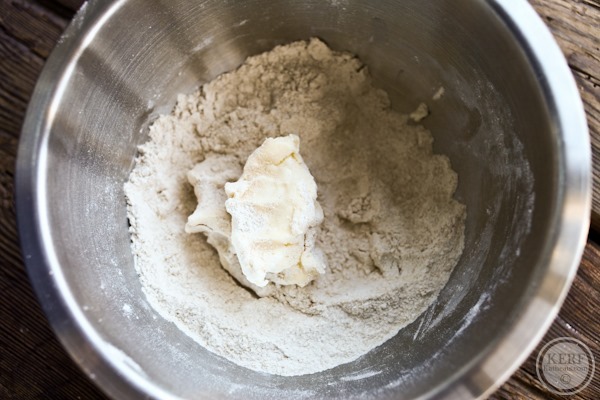 Mix flour and sugar together (and salt if needed) until fully incorporated. Add butter and squeeze together until butter bullets are formed. Begin by adding 2 tbsp ice water and mixing, adding more if necessary. 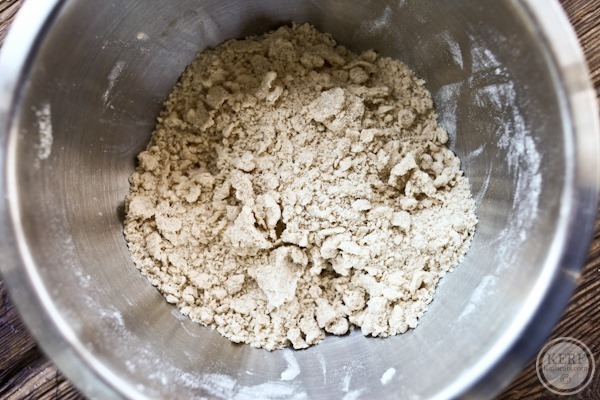 Mix until a shaggy mass is formed. 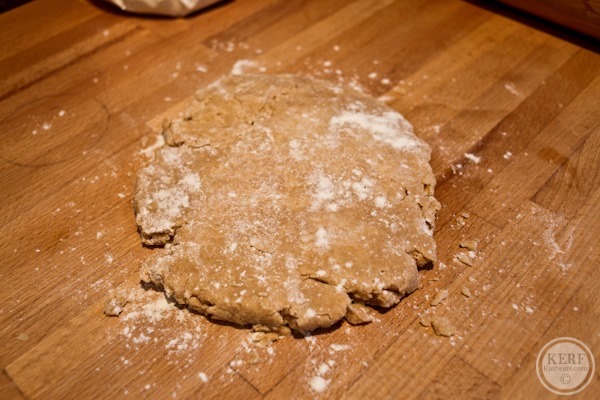 Turn dough out onto a floured surface and roll out until slightly larger than the diameter of the pie pan. 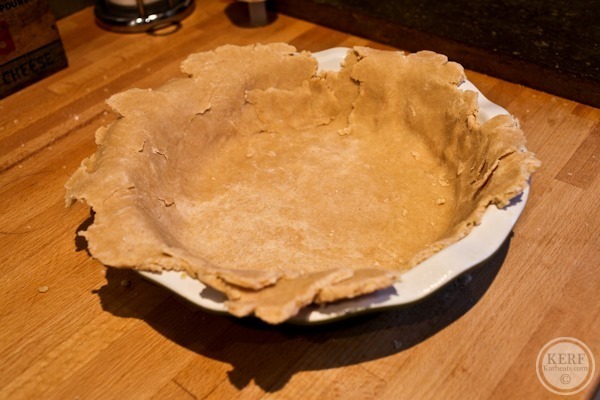 Spray pie pan and place crust inside. 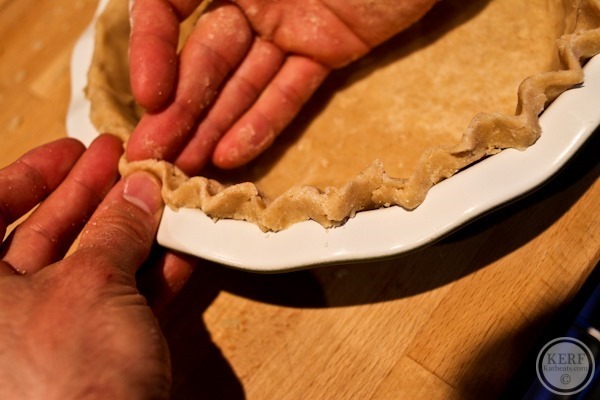 Even crust out, and then shape and flute (see above). Cook fillings, using salt as needed. Set aside. 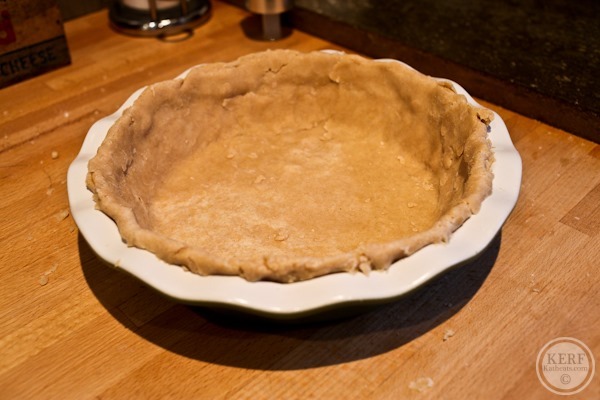 Place fillings into finished crust, and then pour egg mixture on top. Lightly stir to ensure incorporation. Add cheese to top, if using. Bake for 40-60 minutes, until liquid is springy and no longer jiggles when nudged, and crust and surface are nicely browned. We usually serve this for dinner with a nice green salad on the side and eat the rest for lunch the next day! This looks easy and perfect for brunch! Gotta love the way a man gives instructions! HAHA It’s actually very effective! LOVE it when Matt visits! Haha, it’s all about practicality and efficiency! This looks like a great breakfast option during the week. Make on a Sunday and enjoy all week long! 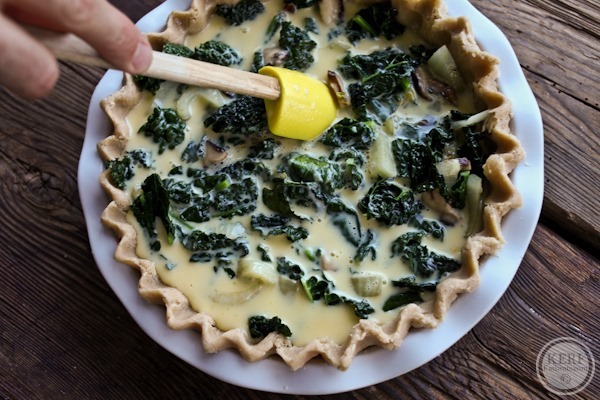 I was already in charge of a quiche for Easter – thanks for the ideas! Thanks Matt!!! I love the word egg milk. This looks amazing! 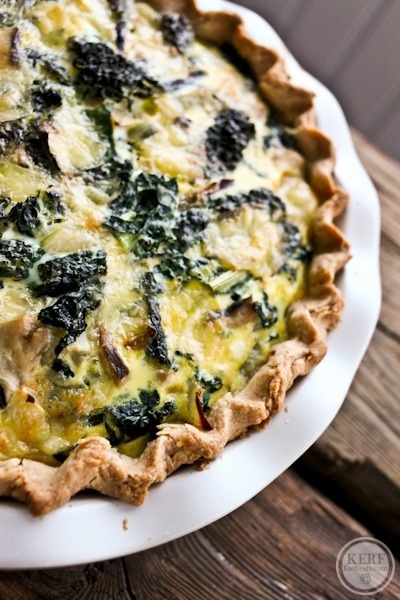 Quiche is a fantastic dish to make for Easter brunch. Your pictures make it look so delicious. Thank you for the recipe idea! Ohhh I’ve been waiting for this recipe! It looks delicious, and you make it look so pretty! This looks delicious!! Can’t wait to try. Thanks for posting! It’s always fun to have these guest posts from Matt! 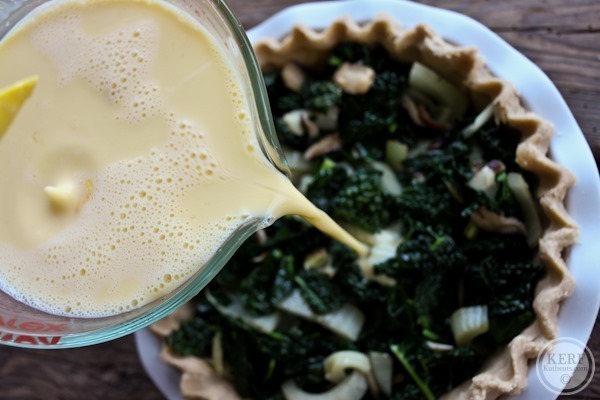 Quiche was my favorite dish as a kid–I always requested it on my birthday. I can’t wait to make my own crust using this recipe. Thanks for the wondeful tutorial, Matt! This looks perfect! I never think to make quiche. I bake egg casseroles all the time. I need to ad quiche in the mix next time! Please, what size pie pan are you using?? I learned a lot from this post…thanks Matt! I haven’t had quiche in a while, I’m thinking it’s long overdue! Oh yum! What a perfect Easter quiche. I’ve been wanting to make one since eggs are on sale this time of year. I can’t get over how amazing that crust looks! You know it’s going to be flaky just by looking at it! Wow what a beautiful dish! Fresh, delicious food at its best. 1 – I think Matt should hold a men’s cooking class. I’d sign my husband up in a heart beat. 2 – Did Matt get a degree in baking? Or just learn on the job? 3 – I want to eat all your food! I’ve witnessed more than one holiday tantrum as a result of trying to use unchilled butter in a pie crust! Usually my mom could save the dough if it got overworked and too warm but she definitely tossed a few over the years. Good to know quiche is more forgiving! Although I do take it one step further in the lazy aspect and just make frittata 🙂 Either way, love eggs and veg together! 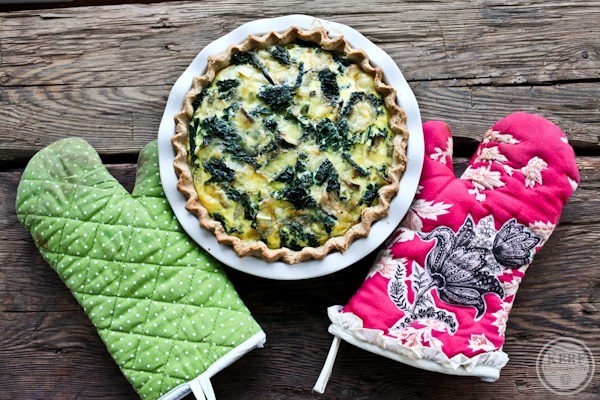 Quiches with a homemade crust have always intimidated me…but perhaps I should give it a try! My mouth is watering reading this recipe! I’m going to have to try it soon! Hehehe I loved this post and hearing from Matt! 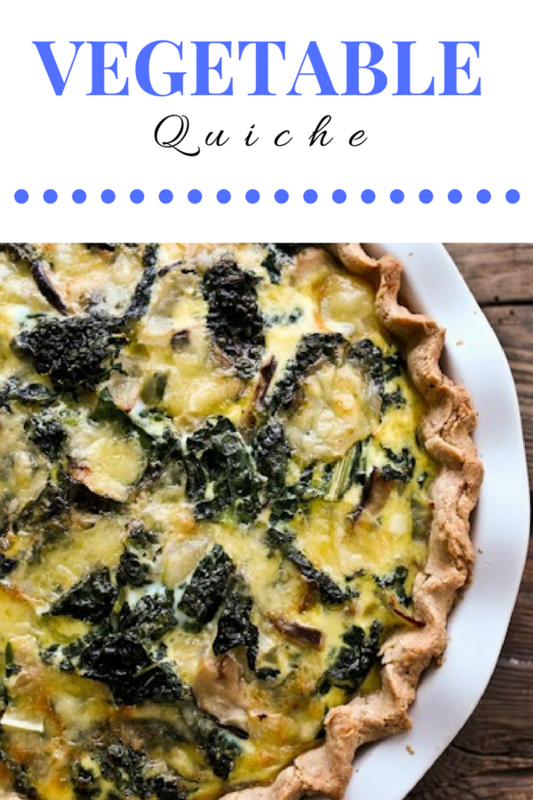 The quiche looks truly scrumptious, and I agree in that it’s one of those foods that can be incorporated with pretty much anything that can be chopped and thrown into the mix. Yum, excellent tutorial. Thank you for posting this!! I love quiche! I love quiche. You can vary up the ingredients. Have it for dinner and there is plenty of lunch and breakfast leftovers. Now if only my husband who loves eggs enjoyed it more. 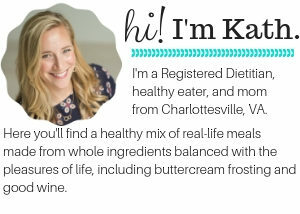 Kath, this looks super delicious!!! I can’t wait to try it! 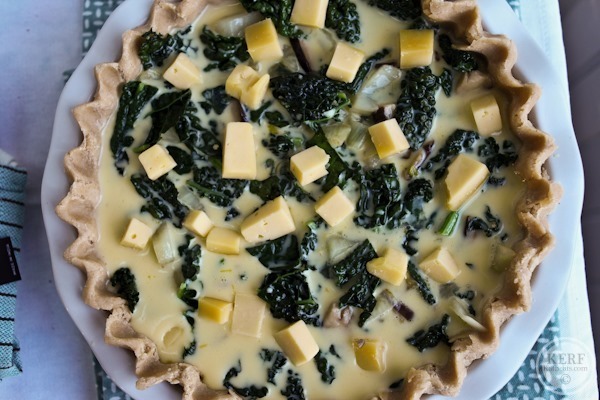 I’m so doing this quiche this week! thanks!!! I love when Matt pops in with his food nerdiness! Thanks so much for the tutorial! Quiche has always been something I’ve been a little nervous about making, but this makes it look so easy! I love quiche as well. I like to add a couple of full tablespoons of grated Parmesan when I prepare the crust. It gives it an edge. Quiche with spinach and goat cheese is my fav number one. Great looking quiche. Now we all know what that plastic blade is for. This looks great! I am always looking for different veggie combinations and one that heavily utilizes leafy green and mushrooms is right up my ally. 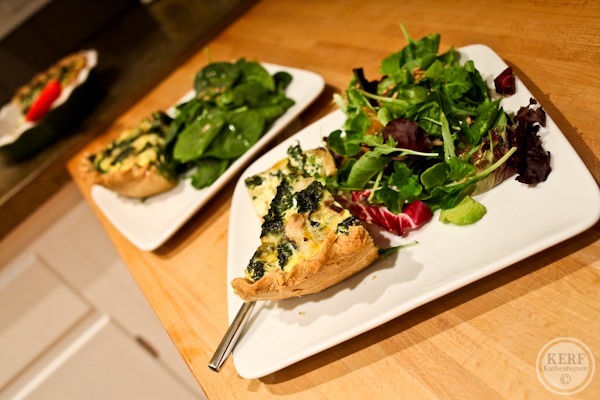 Quiche + salad = perfect brunch! What a gorgeous quiche! Great job Kath and Matt! This has to be the prettiest quiche I’ve ever set eyes on. Put flour and salt in mixing bowl. In small bowl whisk oil and cold water until thickened. Pour into flour/salt mixture. Mix well. Allow to sit 5 minutes. 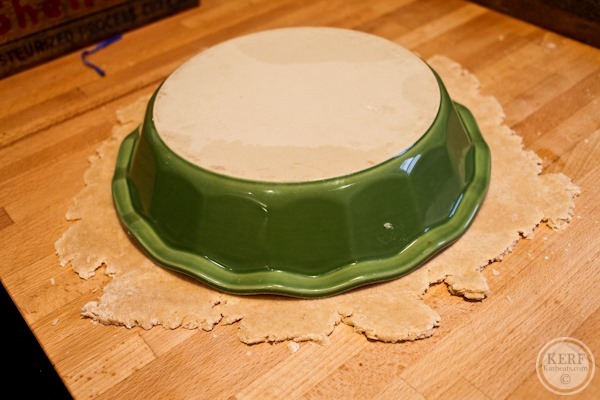 You may press into pie dish, but I prefer to roll it out on a silicon mat and slip it easily over the pie plate. 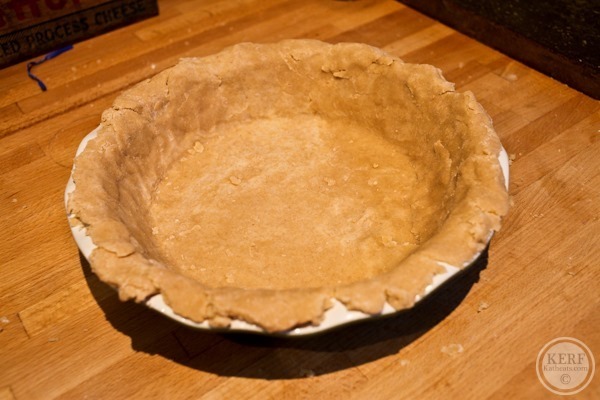 I generally use a 10″ stoneware pie dish. 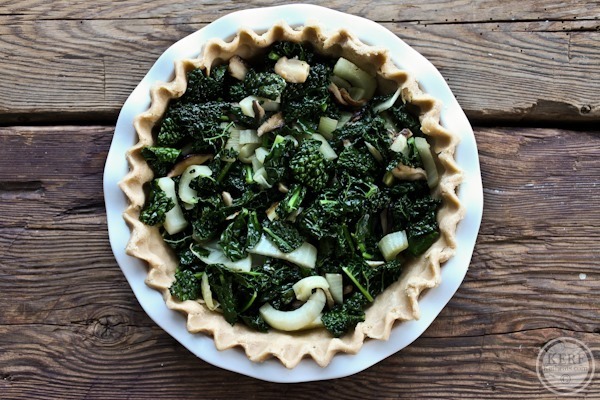 Super forgiving recipe, suitable for a savory pie only. 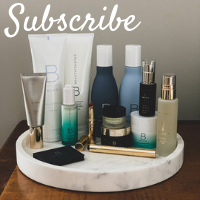 Love your site – get lots of inspiration from you guys! Keep it up, please! 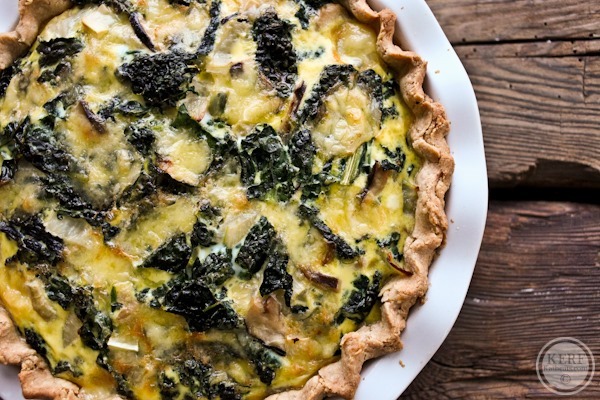 I love how simple and easy this quiche is. And I definitely enjoyed reading the simple, straightforward instructions. Thanks for this. Kath Eats Real GOOD Food! This sounds delicious!! This is a great recipe! My kids will love it. 😀 They can even help me out making this Vegetable Quiche. I would like to add some chili sauce or bell pepper to spice it up. Also, I like the way you make the crust. matt mentioned storing the crust in the fridge…how would you do that? Covered with plastic? I made this today. Kind of. I omitted the crust (I had no pastry flour on hand), so actually, since the crust is the most intensive, creative, delicious part, I didn’t really make this at all. BUT… the filling made in a 10×10 glass dish was pretty amazing. I used mushrooms, kale, and arugula for my veggies, with a combo of parmesan and goat cheese. I will DEFINITELY be making this again, with the crust (probably next weekend!). Thanks for the tutorial!! This quiche does look awesome! I love quiche will be sure to get this recipe to my wife. 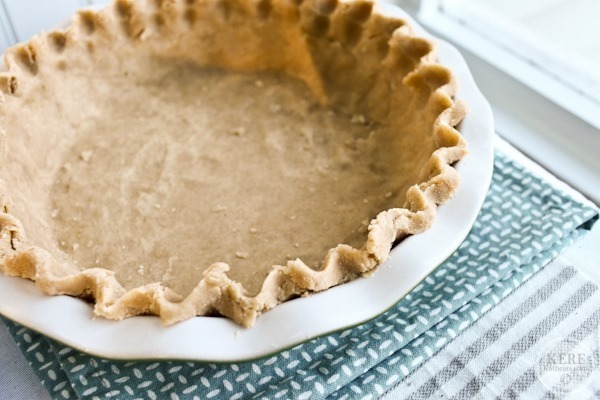 Do you pre-bake the crust for a little but before the filling goes in? Thanks! I have made this quiche twice now with mushrooms, onions, spinach, and goat cheese, DELISH! Thanks for sharing your recipe! I made this recipe two days back and I must say it was simply delicious. I added some chilly flakes and chives to the egg milk mixture to spice it up. I have never been successful with a super crispy pie crust but this one was really good. I could achieve due to your rather simple instructions on how to assemble the dough. Hi wow I just made quiche from your recipe with Brussels sprouts, porcini mushrooms,& sundried tomatoes! Absolutely delicious!! Sadly I had to use white flour but am getting wheat tomorrow. I’m really excited to try w wheat flour should add a bit of nuttiness. Oh I also grated some fresh nutmeg over Brussels sprouts which heightens their flavor. Thanks Kath & everyone else for sharing. Kath I’m tickled I found recipe thanks again. I just made this, it is awesome! I used a couple leftover turkey patties that I crumbled, with sautéed spinach and cheddar cheese. My ‘turkey burger’ quiche turned our great, thanks! Hi I came across your recipe. So very good. I even purchased wheat flour for the crust. I make it every week!! Have used Brussels sprouts porcini mushrooms & Sun dried tomatoes what a fab combination. I’ve also used eggplant. Also really good. The only addition I made was grating some fresh nutmeg on top of egg mixture before the oven. Thanks for posting your recipe!! It is great! I also pinned it too. I made the quiche last night after procrastinating for, oh, about 10 years about making quiche. It worked a treat! It did me a little longer than Matt explains, so next time I’ll start a bit earlier with the crust… Big bonus: My husband loved it! It came out delicious, so I made it again this morning for brunch, only this time I used lemon juice instead of water (that, and a hint of dried basil) and wow. The dough texture came out a little bit different, and I’m sure third time will be the charm, but the smells coming out of my oven right now…..
yum, i’e not had quiche in ages, thnaks for sharing this recipe. 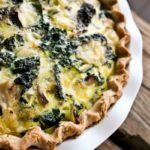 This is my go-to quiche recipe! The crust is divine, buttery and flaky. My friends and family beg me to make this! Thank you for sharing. After reading a bunch of quiche recipes, because I do not bake and don’t know about pie weights etc and have not made a full on homemade quiche before, this one spoke to me! I understood everything! But I do not have wheat flour. And am wondering if I can just make the crust with just 2 cups of all purpose flour? I also see this recipe was posted 6 years ago- so I have no idea if you are still responding to comments! But thank you for an easy to digest recipe. Regular white wheat flour should be just fine!